Kit preview of Aoshima's Black Ryvius. Overall Rating: 8 - funky looking weekend project. The latest series from Japan's powerhouse Sunrise animation studio, MUGEN NO RYVIUS (Infinite Ryvius), sees a group of teenagers sent into outer space and pretty much stranded there. ^ Molding and detailing is decent thoughout. It's the year 2225 AD, the solar system is awash in a sea of plasma and cosmic rays as a result of an unusual solar flare that occurred almost 100 years prior. Though this nebulous sea, called the Gedoult, is a navigational hazard for space travelers, mankind has established outposts in the outer reaches of the solar system. The main characters, and many of the rest of the huge ensemble cast, are serving as astronauts-in-training aboard the Liibe Delta, a space station in Earth orbit that is monitoring the Gedoult. 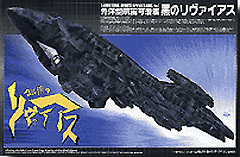 The station is sabotaged, and the trainees are forced to evacuate into the Ryvius, an experimental spaceship that was hidden in the core of the Liibe Delta. The adult instructors are killed during the evacuation, and the trainees end up being controlled by a gang led by one of their number. That's how it starts, anyway. Inside the box are parts to make the ship, it's battleguard, (a giant robot controlled by a smaller craft like a marionette), the battleguard's weapons and the control craft. 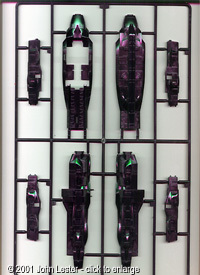 You can build everything separate, or complete, and bases are provided to display either option. 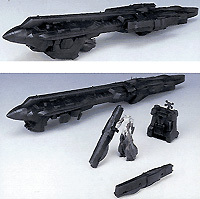 There are two sprues of black parts, one of the clear bases and supports, and an instruction "booklet". Molding of the plastic parts is pretty good - not as good as, say, Hasegawa's latest, but certainly acceptable given the scale of the model. Everything is bagged separately to prevent scratching during transit - something I wish American manufacturers would do more often. Instructions are comprised of the usual diagrams with Japanese text, broken into 14 steps. 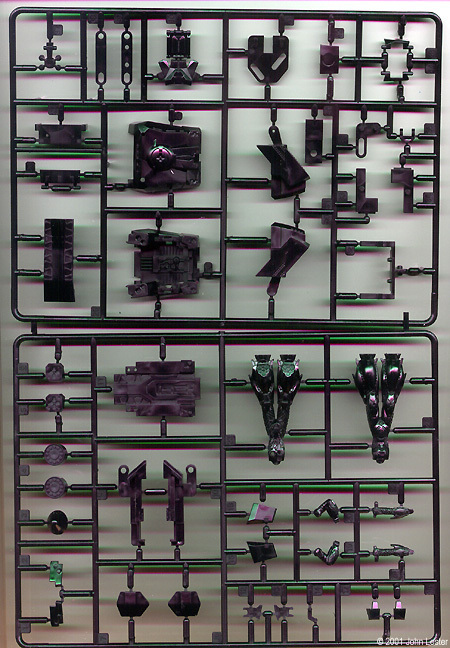 Though I can't read the text (or the paint guide, for that matter), assembly should be a breeze. The diagrams are more than adequate. 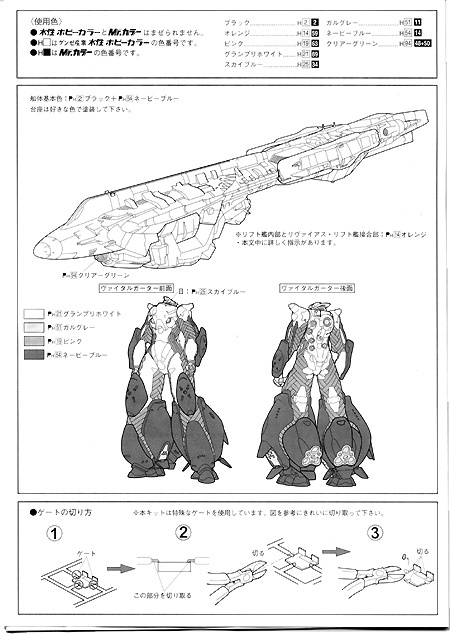 Unlike Bandai, Aoshima doesn't routinely include color sections showing the completed model, and the paint guide is all in Japanese. Could be a problem, if I cared at all for total accuracy with what's seen on-screen. There are no decals, but the ship doesn't carry any markings, so they're unneccessary. Assembly should be - forgive the term - a snap. 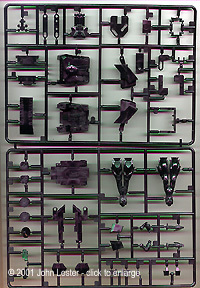 There really aren't that many parts, and the dry-fitting I've done suggests there should be no surprises. I'll probably build it up with all components attached to the ship, rather than make all three vehicles separate. Painting should be equally challenging - after all, the ship is black all over. It'll give me the opportunity to play with different dry-brushing and wash techniques, which should be fun. Looks like a good kit. It's simple enough that even I stand a real chance of finishing it over the course of a weekend. For those interested, a black-chromed model is available, as is a kit depicting the "final version" of this ship (which includes a resin figure of one of the main characters). Recommended to even novice modelers. Many thanks to my wallet for providing the review sample. Manufacturers and retailers, interested in getting your wares reviewed and publicized on a site averaging 2000+ readers a day? Contact us! This page copyright © 2001 Starship Modeler. Last updated on 22 March 2001.